If you've been looking for a secret, underground lair with built-in submarine parking and minion office space, you're in luck. 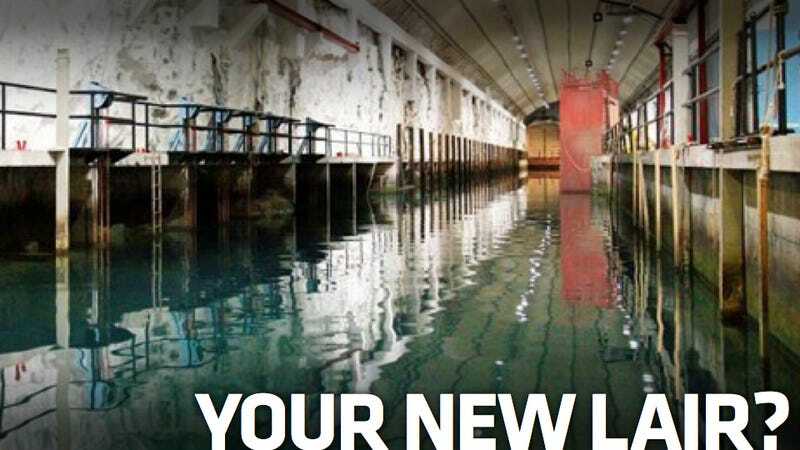 The Royal Norwegian Navy recently put a secret mountainside sub base up for sale. Considering that the North Atlantic Treaty Organization (NATO) spent $494 million to build the Olavsvern Naval Base back in 1967, it's a steal at $17.3 million. The base used to house Norwegian and NATO forces, and served as America's North Sea headquarters during the Cold War. But when the cold war thawed, melted and disappeared, Norway and NATO lost interest. By 2002, subs were no longer sailing in and out of the side of a mountain and the base's 270,000 square feet of underground docks, tunnels and rooms (with an additional 145,000 square feet of above ground office space housed in a quaint brick building) were vacant. This place is so Dr. Evil. We're pretty sure there's room for a tank full of ill tempered, laser beam shooting sea bass. The tank would, of course, be equipped with an unnecessarily slow dipping mechanism. What are you waiting for?